Have you always wondered how much water you should drink? The most commonly recommended amount is 8 glasses or 2l per day. 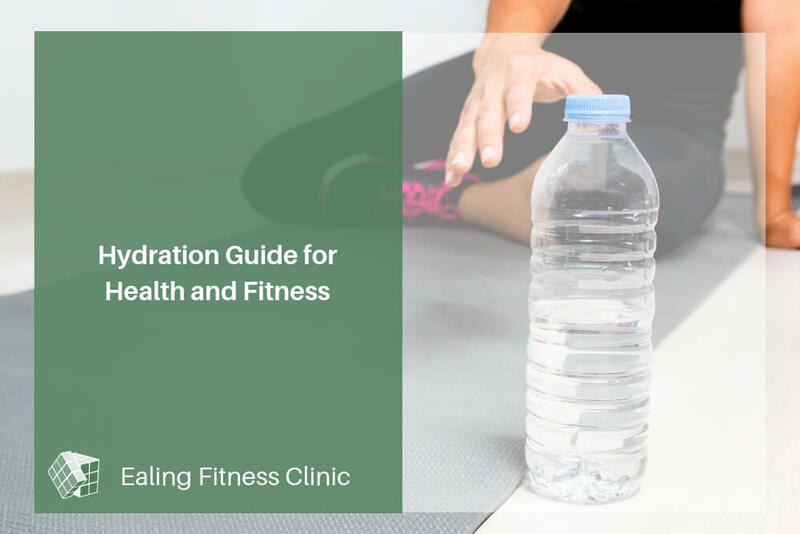 Claire, our resident sports nutritionist, personal trainer and sports massage therapist, has created a selection of guides available for you to pick up from the clinic reception. This article will discuss her findings on hydration, its impact on the human body and how to measure and ensure you are staying in the “transparent” zone. The problem with the general recommendation mentioned above is that it doesn’t consider the individual’s body, weather conditions, activity levels and how they may affect the metabolism which is ultimately is responsible for keeping our body running at an optimum level. Another vital aspect to consider is the impact of dehydration on sports performance which is usually understated. 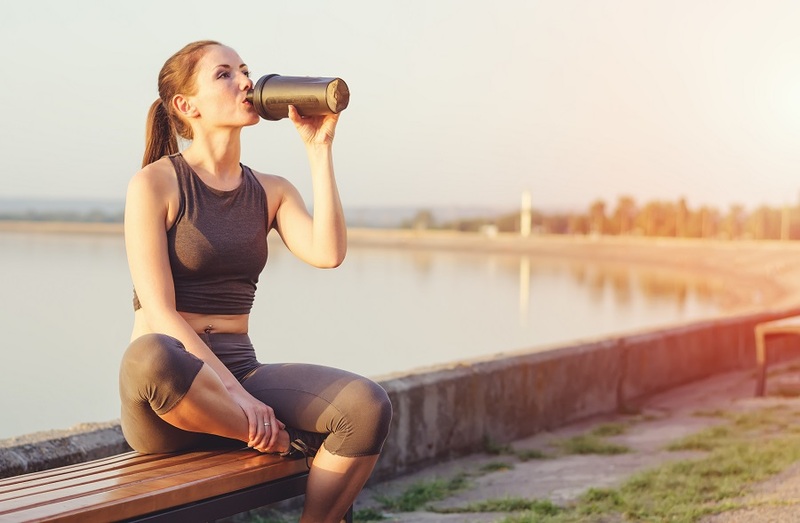 If you are an amateur athlete participating in regular sports activities, it’s imperative that you understand how your own body works and when to replenish water and minerals to maintain adequate hydration throughout the day. When you are sitting on the sofa all day, you don’t need as much fluid as when you are attending an endurance event. Over half the weight of the human body is made up of water. Water helps carry nutrients around the body and flush waste products out, regulates body temperature, and helps lubricate and cushion joints. In hot conditions, or when exercising, we sweat to cool our skin down. Sweat rates can vary widely but are estimated to be between 0.5L and 2L per hour. Dehydration not only affects your physical fitness, your cognitive functions like concentration, memory and critical thinking will also suffer. Losing 2% of body water through sweat leads to significant decreases in performance and cognitive function. Recent studies also show that even mild water body loss (1-2%) can impair the latter. Extreme water balance in the body, both dehydration or hyperhydration (water intoxication) can lead to exhaustion, dizziness, headaches, nausea, fatigue and possibly even death when not treated. Now you understand why it’s important to find the right balance between not drinking enough and taking in way more water than needed. The best way to avoid dehydration is to begin your training session well hydrated. 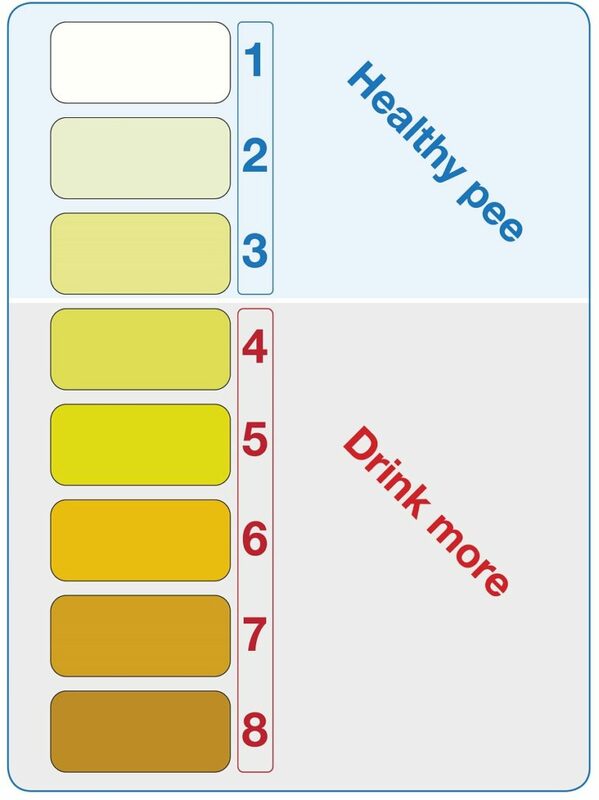 You can monitor your hydration status throughout the day by checking the colour of your urine, for example using a “Pee Chart”, and ensuring it is clear or pale yellow. If you are concerned about dehydration, try weighing yourself before and after training to see how much weight you have lost from sweat. (Remember to remove sweaty clothing first.) You will need to consume 3 cups (750ml) of water for every pound (400g) lost. This may seem a lot, which it is, giving you a good reason to prioritise staying hydrated before and during your session. adding a small amount of squash, fruit juice, or a squeeze of lemon or lime to your water – or make yourself a bottle of iced herbal tea. When it comes to sports performance, for example, long endurance sessions, re-hydrating with water will not be enough to maintain peak performance. For sessions longer than 1 hour and/or in hot conditions, you may need to add electrolytes to your water. There are many sports drink brands that are trying to sell their products to athletes with the promise they will boost their performance. Make sure you check the labels and choose a product that provides you with the electrolytes but doesn’t have too much nonsense added. Keep in mind that coconut water is not a suitable drink for rehydration purposes, as it is too low in sodium. Did you find this article helpful? Feel free to share it with your friends who can use the information provided. If you need help with your diet, feel free to contact Claire for a consultation.